How does a sculpture in clay become a bronze sculpture? Each time you visit a museum, a studio, or a gallery, knowing the answer to this question will enrich your art experience. That is precisely why I have included this explanation. I have attempted to distill the ancient and complicated process into five steps which explain each part of the Lost Wax Casting process. No wonder bronze statues are costly. It is not only the talents and time of the artist, but this casting process itself is very time consuming and requires skilled artisans. Enjoy! The origins of the lost-wax process of metal casting, called cire perdue, are lost in the mythologies of the Bronze Age, in the Far East as well as in Europe, Africa, and pre-Columbian America. Earliest records show the process to be over four thousand years old. 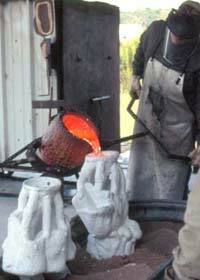 Art bronzes today are cast using the very same process as that of ancient times. Technologically the materials have improved, but the process remains the same. As you will learn, the high cost of a bronze sculpture is due to the many hours of hands-on-labor involved. Once the clay sculpture is completed by the artist, the entire process in the foundry takes from six weeks to four months to produce a single bronze. In order to simplify a very complicated process, one must think of the process as five alternating positive and negative steps. For example, a positive form would be your hand. If you were to press it into wet sand and remove it, there would be an exact negative impression of your hand. The original sculpture is completed. This sculpture may be in clay, wood, stone or metal. This is the first positive. A mold is made of the original by coating it with rubber supported with a plaster "mother mold". This is done by encasing the original sculpture in rubber applied in layers. Most sculptures will require several parts to the mold. For example, a torso might be one part of the mold, and a leg another, and a head another. The original is now removed from the mold making the mold empty. The empty mold is the first negative of the process. Molten wax is poured into the mold and then poured out evenly coating the interior walls of the mold. About three coats of wax will make a hollow wax replica of the original sculpture with consistent 1/8" thickness. After cooling, this hollow wax replica is removed from the mold. This wax replica is the second positive in the process. Any surface imperfections in the wax are corrected. For each sculpture to be cast in the edition, separate wax replicas are made. If the edition is 20, then 20 wax replicas will be made from the same mold. The wax replica is then sprued and gated. This means that a wax pouring cup, wax rods, called "sprues" that will later serve to channel molten metal into the piece, and air vents to release trapped air when the metal is poured are attached to the wax replica. This engineering process is to prepare the piece for the bronze pour. Now an investment, or "ceramic shell", is applied to each wax by dipping it into a heat resistant liquid, or "slurry", and then coating it with a heat resistant sand or "stucco". Each of the 6 to 12 coats must be dry before the next coat is applied. This step normally takes between one and two weeks. This ceramic shell over the wax replica has created the second negative. After the ceramic shell covering the wax is completely dry, the piece is inverted and placed in a kiln at 1800 degrees which causes the shell to become strong. The wax melts and pours out of the ceramic shell; thus the term "lost wax". This empty ceramic shell, the second negative, is placed in a sand pit with the pouring cup uppermost. Molten bronze heated to 2200 degrees is poured into the cup and down through the sprues into the cavities of the shell. As the bronze cools, the last positive is created. After a cooling period the shell is broken away revealing the bronze casting. Sprues are cut off, and the sculpture is sand blasted. Any parts which were cast separately are welded back together, and the surface is ground to resemble the surface of the original sculpture. This reworking of the surface is termed "metal chasing" and takes many hours of labor intensive work. The final step is coloring the bronze. The ancient Asians would bury their bronzes to naturally oxidize them, sometimes for years. The coloring is called the "patina". Today the oxidation and coloring can take place within hours. The "patina" is applied by brushing or spraying various chemicals onto the metal with or without heat. Different chemicals are used to create a variety of colors. Often acrylic is used to simulate chemical colors. As you can see, each bronze is truly unique because of the hands on labor that is involved, even if it is one of an edition. The sculpture is a result of a marriage between the artist and the foundry. This ancient process produces a bronze sculpture that will last for generations to come. What a treasure! Once a year the bronze should be wiped with a clean, soft rag. Use a soft brush and apply a coat of Johnson's Paste Wax or Tree Wax to the sculpture. Allow it to sit for an hour or so and then buff it with a soft brush or rag. This will protect your bronze from the oil of human hands, dust, and grease. Outdoor bronzes should be treated twice a year by cleaning and waxing the metal. Craftsman fills mold with molten bronze.